PETRVS. ALEXII. FILIVS. D. G. TZAR. ET. MAGNVS. DVX. TOTIVS. RVSSIAE. Signed: under bust in Cyrillic ? / C. IO. Peter I (The Great) (1672-1725), Russian Tsar (1682-1721) and Emperor (1721-1725) was the son of Alexei Mikhailovich. 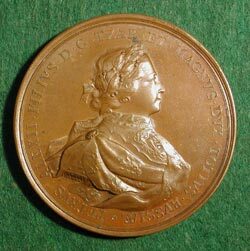 Peter inherited a landlocked nation, and gaining access to the sea and establishing a strong Russian fleet (the subject of this medal) became the chief objective of his foreign policy. 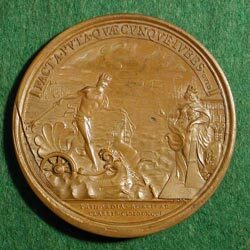 To this end, he battled several countries, including Turkey, when in 1696 (the date this medal was issued) he captured Azov from the Tatar servants of the Ottoman Empire, thus securing an outlet to the Black Sea. However Turkey regained Azov in a battle of the Russo-Turkish Wars. In an attempt to gain access to the Baltic Sea, Peter engaged and defeated Charles XII of Sweden in the Battle of Poltava (see below), securing the Baltic port of St. Petersburg, which succeeded Moscow as capital of Russia. At home Peter launched a rapid modernization of Russia, based on knowledge acquired of new industrial methods in Western Europe. These industries mainly used serf labor, and Peter brutally suppressed serf revolts. In other areas, Peter broke the power of the Boyars (landed aristocracy) by abolishing the Boyar council as the supreme central organization, replacing it with a senate. He also created a meritocractic system of appointment, ending the rule of promotion according to ancestry. In the area of religion, Peter placed the Russian Orthodox church under state control and encouraged secular education. In 1712 Peter married Martha Skavronskay (later, Catherine I (1648-1727). Following the death of Peter in 1725, there was a great turnover of Russian leaders. Catherine I ,who succeeded him to the throne on his death became Empress of Russia in1725. Just two years later in 1727 she herself was succeeded to the throne by Peter II (grandson of Peter the Great and Russian Tsar from 1727 to 1730). Peter II died of small pox on the day of his wedding in 1730 and was succeeded by Anna Ivanova, the niece of Peter the Great and daughter of Ivan V, the half-brother of Peter the Great. On the death of Anna in 1740, Ivan VI, the great nephew and adopted son of Empress Anna was proclaimed Emperor when he was only eight weeks old. In 1741 a coup d'etat took place and the tsarevna Elizabeth (the daughter of Peter the Great and Catherine I) was given the throne. Elizabeth (1709-1762) remained on the throne until her death in 1762, at which time she was succeeded by her nephew, Peter III, who died later that year, perhaps by murder. On his death Catherine II (The Great) ascended to the throne.